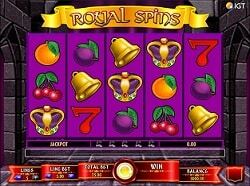 Royal Spins is IGT’s slot machine, and it offers us a classic theme that is packaged in a modern layout. It’s nothing innovative there, as quite a few slots have already done this in the past, though few have managed to put out a great design at the same time. Most of these slots seem cursed to offer the same rather basic design, closer to the look of a game from two decades ago, not to the high end titles being launched these days. In the case of Royal Spins, the symbols are mostly classic ones, meaning images of bells, a red 7, plums, oranges and cherries, but they did include a more royal looking Crown as well, to represent the features on the reels. The action takes place inside the castle, so you see the stone walls all around. As I mentioned before, it’s a rather modest looking game, nothing that will attract a player. I think that you will find Royal Spins’ developer, IGT, to be a good source of slot machines, this game not included. They’re among the biggest creators of such games for the casino industry, activating both offline and online through their various brands (Spielo might be a familiar one for many). I’m rarely a fan of their graphics, but I have to admit that they do use their imagination and create interesting features in many of their slots. Even though you have only 5 active lines in this game, you will have the option to reduce the number further should you want to. Each of those lines require one coin for the bet, and you can decide only on its denomination. It starts at $1 per coin, and goes up from that point, to very high values if necessary. There is nothing overly complicated about Royal Spins. The bets, displays and Spin button are all at the bottom, with another row below them giving you the paytable and the game rules. As a slot machine that doesn’t try to put too many features in front of the player, the only symbol that will bring you something will be the one that actually has a somewhat related image, that of the Crown. The Crown is a scatter that you need to appear on consecutive reels, so it’s not even a true scatter symbol, since there are limits which require it to appear in certain columns. The Crown Bonus brings the player 3, 5 or 10 free games, provided that he gets 3 to 5 of those Crown scatters on consecutive reels. There are payouts as well given away, once you’re in free spins mode, varying between 1x and 200x total bet. Something a bit more unusual would be the Cherry Bonus Meter, which you fill with one cherry each time that you get a win with five Cherries in it. Get all five, and you win a progressive jackpot. The game has a couple of ways to pay up to 1,000 coins to you, plus there is a progressive jackpot mentioned as well. IGT announced a theoretical RTP that varies between 91.88% and 96.03% for Royal Spins. It sounds good only on the higher side, but on the low end it doesn’t give the player an attractive enough offer. All things considered, from the graphics, the number of features and the average RTP that you can expect, I’d say that the slot gives you plenty of reasons to stay away from it.